The Kindergarten Diploma Template available here for download for free and can save you time. It is fully customizable. It is also very easy to use but below is a little run down of how to use it, as well as a couple of tips that can save you precious time in the office while printing them up. When you download the file, it will open in Microsoft PowerPoint or later and other compatible programs. The first step in customizing it to your own school is adding your school’s name where the [School Name] is on the document. You can fill in the date next. It goes on the bottom right under the [Student Name] which you should wait to change. You will come back to this in a second. Below the long line on the bottom right is a space for the presenters name that you can change that as well. Now that you have changed the items that will be the same on all Diplomas, save your file and proceed to the tips. 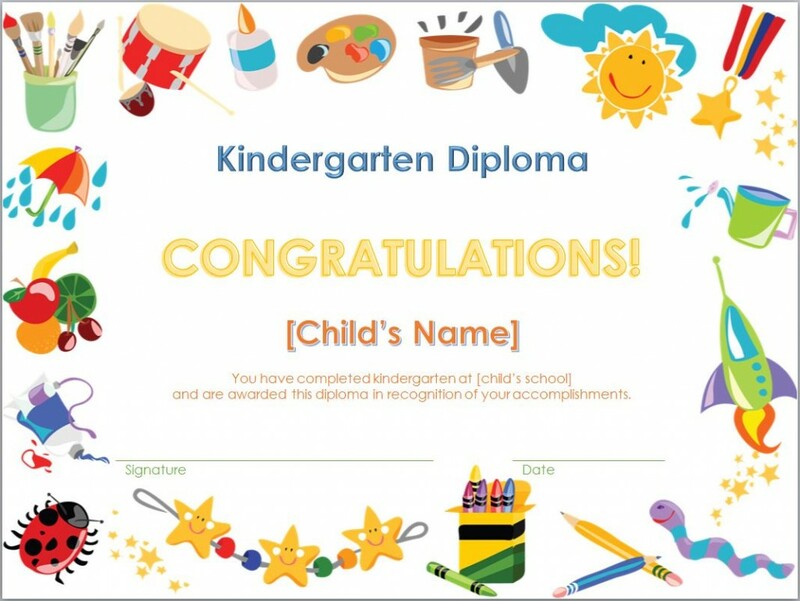 Now that you have saved your Kindergarten Diploma Template you can begin making and printing out all of them by simply changing the name. You can also change the images and even add your school mascot, or a nice quote that fits the occasion, like, ‘to new beginnings’. After the item has been printed out the presenter should sign the document to make it official. You could even add glitter or paint to really make for a nice and unique Kindergarten Diploma. A really nice touch would be getting a small picture of each child’s face and adding it to the template before it is printed out. This can easily be done with a digital camera and a connection cable. You can download this Kindergarten Diploma Template to use for your own school for free. It is so easy to customize an use. You will have those little guys graduating high school in no time.